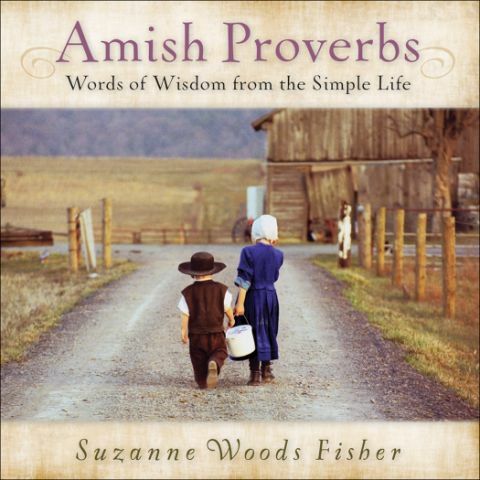 It’s been said that good things come in small packages - and that’s one way readers might describe the newest book by Suzanne Woods Fisher, Amish Proverbs: Words of Wisdom from the Simple Life. On the surface, the book is filled with “pithy” sayings and photography representing the Amish life. On a deeper level, it provides readers not only with an introduction to the Amish faith, but also an introduction to proverbs that come from both the Bible and other cultures. Fisher created Amish Proverbs after writing Amish Peace: Simple Wisdom for a Complicated World. For that book, she turned in a variety of extra proverbs to be included in the final manuscript, which led her editor to consider a book filed simply with proverbs. The sayings found in Amish Proverbs come from, in part, from the Pennsylvania Dutch culture. “Every Amish person is Penn Dutch, but not every Penn Dutch person is Amish – that’s my own saying!,” jokes Fisher. “The Penn Dutch culture grew out of an Eighteenth and Nineteenth century migration period in which many Europeans of German and Swiss descent moved to Pennsylvania. Fisher’s family – on her mother’s side – is Penn Dutch. She grew up with many, many sayings shaping her family life. Some she said, were sweet, some clever, others corny and some were “spot-on!” Many of her family sayings helped shape her book. Fisher divides the book into a variety of themes including family, hard work, time or character. She even included a section “just for fun” to help highlight the Amish sense of humor. She said it’s hard to pick one favorite proverb, because they fit a variety of situations. Many of the proverbs strike a “poignant” cord, explained Fisher. “'The forest would be quiet if no birds sang except the best,'” Fisher said. “As a writer who struggles with self-doubt, that proverb just hits the nail on the head for me. “Proverbs belong to everyone – even King Solomon borrowed many proverbs from the ancient Egyptians,” Fisher continued. “It’s difficult to trace the root of a proverb to the original source—if some sound familiar, it’s because they have changed and evolved through the centuries. Fisher said she hopes readers not only take away an appreciation for the Amish people, but also start collecting proverbs on their own. Amish Proverbs contains five or six photographs which were taken by Fisher. Fisher said she is very thankful for everyone who reads her books. Anyone can subscribe to The Budget, explained Fisher. “I’ve learned so much from studying it – about the life of the Amish, about what thye value and hold dear. For example, stillborn babies have obituatires. The Amish love children and celebrate each one. “A warning to non-Amish, though—the scribes’ letters can be more than a little tedious. I have had to wade through a lot of non-essential information to find small gems of essential information. I really like the simplicity of this book. It's a great "coffee table" book - filled with a lot of great words of wisdom and some beautiful photos. If you know someone who likes to read about the Amish, or someone who likes to read simple and awesome sayings, I think this would make a great gift! Simplify your life with Amish wisdom Through firsthand research and personal relationships, Fisher has collected more than 200 proverbs that uncover the rich heritage, folklore, faith, values, history and essence of the Plain People. These proverbs serve as teaching tools and maxims for practical living--but they're not just for the Amish. They're for anyone who seeks God's wisdom and truth for everyday circumstances. Ranging from the simple to the profound, from the serious to the humorous, these sayings will stick with you through life's joys and sorrows. With beautiful full-color photos throughout, Amish Proverbs is the perfect gift for any occasion. Suzanne Woods Fisher is the CBA bestselling author of The Choice, The Waiting, Amish Peace, and Amish Proverbs. Want to win your own copy of the Amish Proverbs? Post your own family proverb or wise family advice (or even tradition) as a comment on this blog - by Sunday, Sept. 5. One winner will be chosen randomly from the entries. Suzanne's Amish Proverbs just hit the shelves. To celebrate she's giving away a KINDLE and throwing a party! Let the fun begin. See below for info and links. Find out more about the book, Fisher and the blog tour here. To enter, simply click on the icons below to fill out the entry form, then tell 5 or more friends about the contest. Oh, and enter soon! Winner will be announced on September 1. Join Fisher for a Wrap-up Party on September 1! Fisher will announce the winner of the Simple Wisdom KINDLE Giveaway, chat with readers, and give away copies of Amish Proverbs and The Choice! A favorite saying of mine is: "Worry is like a rocking chair, it gives you something to do but it doesn't get you anywhere!" Thanks so much for your lovely review of "Amish Proverbs!" Kaylea--a motto our family adhears to is: "Work with what you've got." Simple, but keeps us grounded. We find our projects are so much more fulfilling when we get creative and sustainable when we use what we already have instead of adding to the "stuff". Kaylea, Your interview with Suzanne about this remarkable book is an educational experience. I enjoyed it and Suzanne's writings very much. Amish Proverbs is such a treasure and will make a precious heirloom for future generations. My grandmother used to say "more things are wrought thru prayer than this world dreamed of," or something quite close. When one of the kids would say something cute and wise, it was always, "Out of the mouths of babes....." Thank you for the chance to win in this giveaway. I hope I do. I'd love to read this book. One of my favorite sayings is "Strive to be like Christ, but never glorify our Christlikeness, in place of Christ." This makes sense when you know that I grew up on a dairy farm - milking time for the cows came WAY to early, to stay up late "goofing" off. I'm sure the students I work with would identify this as a "kaylea-ism." 1) Love God, 2) Love One Another, 3) No Whining. I would love to win. My family loves the Amish and their simple life style. Our favorite proverb is "Do unto others as you would have them do unto you"